Acceptance Commitment Therapy (ACT), Dialectical Behavior Therapy, Functional Analytic Psychotherapy, and Mindfulness-based Cognitive Therapy are commonly referred to as the Third Wave of Behavior Therapy. The first wave started in the 1920s with behaviorists like Pavlov and his work on classical conditioning, and the second wave in the 1960-70’s with the Cognitive Behavior Therapy approach articulated by the Albert Ellis, whose Rational Emotive Behavior Therapy (REBT) worked to ameliorate negative core or irrational beliefs. All Cognitive Therapy is based on the belief that humans’ basic motivation is to survive. It aligns with current research efforts in the area of Brain Elasticity and the basic premise that when you perceive a threat (real or imagined), the body gets triggered into “flight and fight,” otherwise known as the stress response. Over extended periods of time, this has a negative affect on your physical health. 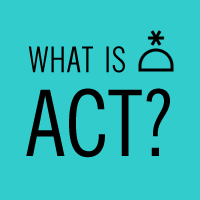 ACT was developed by Steven Hayes, Kelly Wison, and Kirk Strosahl. ACT differs from Cognitive Therapy in that rather than trying to teach people to better control their thoughts, feelings, sensations, memories and other private events, ACT teaches them to “just notice,” accept, and embrace their private events, especially previously unwanted ones. What happens in a ACT counseling session? You will utilize reflections and interventions that teach “self-as-context” – meaning that you are always observing yourself and that your observing self is distinct from your thoughts, feelings, sensations, and memories.